-6- a) Bonfield, Arthur, State Civil Rights Statutes: Some Proposals b) Norams, Charles; Forbidden Neighbors c) Fair Housing Ordinances (N.Y. City, Erie, Pa., Grand Rapids, Mich., etc.) d) Iowa Law Review: Home Rule e) Laurenti, Luigi: Property Values f) Levenson, Frances and Margaret Fisher: The Struggle for Open Housing Progressive magazine g) State Fair Housing Statutes (N.Y. Mass, Conn., etc.) h) Studies by other Human Relations Commissions i) Trends: National Committee against Discrimination in Housing j) U.S. Commission on Civil Rights: Report on Housing, Vol. 4, 1961; Freedom to the Free, 1963 k) Innumerable pamphlets. Further information, especially relevant to local conditions and attitudes, was gained by attendance at many meetings.With the exception of the Commission's request to meet with the City Council, all such meetings and invitations were initiated by groups other than the commission. The Commission used the opportunity of these meetings to learn what the attitudes of these citizens were, and to gather further suggestions and recommendations from interested and often well informed citizens. In accepting the invitation from these groups the Commission also used the opportunity to explain the purpose of the Commission itself and to point out that its function was to merely study the matter at hand and to relate its findings to the City Council if they wished to have them. 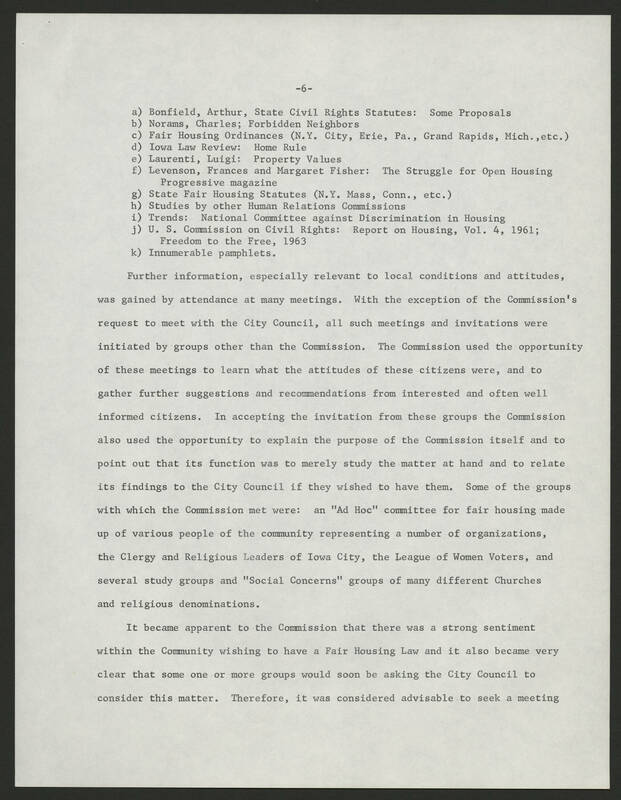 Some of the groups with which the Commission met were: an "Ad Hoc" committee for fair housing made up of various people of the community representing a number of organizations, the Clergy and Religious Leaders of Iowa City, the League of Women Voters, and several study groups and "Social Concerns" groups of many different Churches and religious denominations. It became apparent to the Commission that there was a strong sentiment within the Community wishing to have a Fair Housing Law and it also became very clear that some one or more groups would soon be asking the City Council to consider this matter. Therefore, it was considered advisable to seek a meeting.